At school your children become the responsibility of teachers and staff. All the same, many parents worry about safety – so what can you do to reinforce the basic safety rules at your child’s school? The Royal Society for Prevention of Accidents recommends schools formulate an emergency plan, consulting with local emergency services and education bodies. This would include evacuation procedure, key figures of responsibility, and possibly an incident room too. In America, radical measures have been trialled at schools after the recent disasters. Things like ID badges, biometric identification (using fingerprints to register at school – which has also been tested in the UK for dinners), knife-proof vests and even bullet-proof rucksacks have been offered. In the UK, practical monitoring solutions are being tested: ‘keep kids safe’ is a piece of software for schools that informs parents when their children fail to turn up at morning or afternoon register, and there are also several services that allow parents to track their children using signals from their mobile phones. Making sure that your children are adequately prepared to handle emergencies, and knowing where they are, are two of the best ways to monitor their safety – at least until they are old enough to look after themselves. Children should understand that the same rules apply to using school computers as using home computers. That means good posture, limited usage, and a safety-aware approach. Recent reports have exposed some schools for poor supervisory practices, and good safety awareness starts at home. Parents should ensure that their children know about the dangers of the Internet: unwanted attention, fraudulent practices, and suspicious websites. 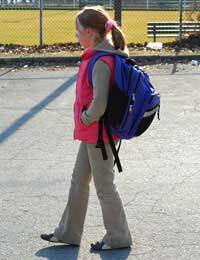 Only 9% of children in the UK walk or cycle to school. While the risk of abduction has not risen since the 1970s, the rate of child obesity has. Although the government is encouraging schools to develop walking groups and cycle facilities, parents can help too. Setting up a local get-to-school group is a good start. These are usually chaperoned by one parent every day, and allow the children to learn about road safety in a protected group. Once they are old enough to understand the safety rules they can travel alone. What are the rules for safe walking or cycling? Walk or cycle with friends – it’s the first form of protection. Wear the proper gear: that means bright or fluorescent tape or shoes in winter, cycling helmets and pads, and a rucksack that straps firmly over both shoulders. Choose a bright, open route – avoid alleyways or dark roads. Look out for safe places where you could shelter or call home if you have a problem. Garages, busy shops and friends’ houses are all good. Walk on the same side as oncoming traffic, so that you are facing the cars that pass closest to you. This makes you more aware of imminent danger. Cycle (once you’ve passed cycling proficiency) on the same side as traffic that is travelling in the same direction, so you are being overtaken by cars that pass. When you need to cross a road, Stop, Look, and Listen. Cross carefully, watching on both sides, and don’t dawdle. Use the left-hand navigation menu to find out more about children's safety.